This is a 32 x 40" Bright Silver Reflect-o-Board from Savage. These Reflect-o-Boards can be used as backgrounds, or inexpensive, expendable reflectors. Made of easy-to-cut, easily bendable poster Added dimsboard, 32 x 40" (81 x 102 cm). This is a single bright silver-finish board. 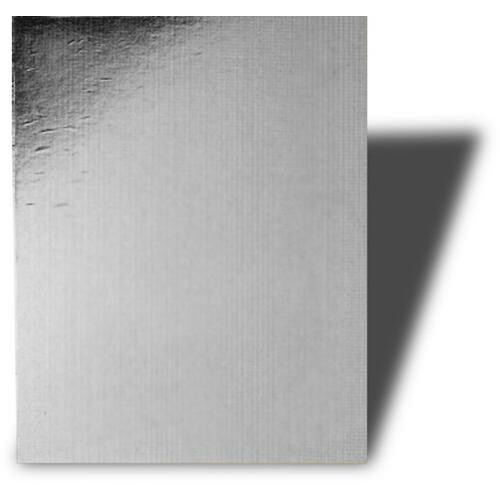 Box Dimensions (LxWxH) 44.0 x 33.0 x 0.5"
Bright Silver Reflect-o-Board (32 x 40") is rated 4.8 out of 5 by 14. Rated 4 out of 5 by calmkevin from Great product to photograph small items in photo box I gave it a 4 star rating because it scratches easily. However the size of the total board is large enough so It will last a long time since I only need a piece 12x12 in my photo box. It is well worth the extra shipping charge for this item. This product adds a little extra reflection that the other metallic reflective plates don't have. Therefore I suggest you buy it along with the black, white and metallic reflective plates for perfect product photos every time. Rated 5 out of 5 by Kmankos from fills in shadows nicely I use this on top my posing table to fill in shadows under chin. Works like a charm. Can cut to fit, its a sturdy cardboard type, but highly reflective. Rated 4 out of 5 by nolijkwest from not bad Reflective material is mounted on thin flexible cardboard (a little thicker than cereal box cardboard). Rated 5 out of 5 by Windy City Bill from Great Value/Affordable ... if you need this to be the exact size - 32 by 40, pick it up in store rather than have it shipped. Otherwise, I love it! Great value, and I like that I can experiment with it - cutting different sizes and shapes. I bought two so could experiment - wish I had bought four! Rated 5 out of 5 by Mike W from Good inexpensive solution! If you're looking for a good, inexpensive solution for reflectors this is a good choice. The material is easy to cut or shape and inexpensive enough to be considered disposable after some tough use. I use these in the studio and outdoors with good results. Rated 5 out of 5 by Pamela from Great possibilities I am looking forward to working with these reflectors. I got a few so I can cut them to different sizes. They are thin, light and bow easily allowing for creative use. very happy. Rated 5 out of 5 by gabriella from very reliable product I use this mostly in studio settings for reflecting and such. Works like a charm! The iteam can be fragile but with proper care will last many moons. Is this poster board material or cardboard? This product is made of cardboard. What color is the backing?